Nikon Leaks Info About Next Flagship DSLR, the D3? It shoots 9 fps burst in FX (full frame), 11 in DX (cropped smaller). Plus, it has a dual CF card slots. All of this goodness is packed inside of a magnesium alloy body which feels battle-hardened enough to survive the Blitz with its delicate innards completely intact. It's also heavy as a mother. It'll start shipping in November for the body-only price of $4999. The D3's new and original 12.1 effective megapixel FX-format CMOS image sensor features a series of technologies that enable it to deliver superior quality pictures throughout the camera's exceptionally broad ISO range. In addition, the sensor's high-speed 12-channel readout allows the camera to shoot 12.1 megapixel images at up to nine frames per second. The camera's ISO sensitivity range is extremely broad, allowing photographers to shoot low noise photographs in a variety of situations. The camera's normal range is from ISO 200 to 6400, and this range can be extended using the camera's built-in settings of Lo-1 and Hi-2 for the equivalent of ISO 100 and ISO 25,600, respectively. The D3 is designed to deliver high-speed performance in virtually any situation. With a shutter release time lag of only 37 milliseconds, camera start-up time of 0.12 seconds, and continuous shooting speed of up to nine frames per second with full resolution 12.1 megapixel images, the D3 is the world's fastest digital SLR camera in its class. * The D3 is also capable of shooting at up to 11 frames per second when using the camera's DX-format mode, with 5.1 megapixel images. The Nikon D3 is also compliant with UDMA memory cards, enabling recording speeds of up to 35 megabytes per second. The D3 features Nikon's new EXPEED Image Processing System that is central to the speed and processing power of the camera. EXPEED delivers optimized performance for the camera and its features and ensures high-image quality and high-speed image processing. Nikon's new Picture Control System, featured in the D3, allows photographers to fine-tune and adjust fundamental rendering options for their pictures so they can define the exact tone, sharpening, brightness and saturation they prefer. 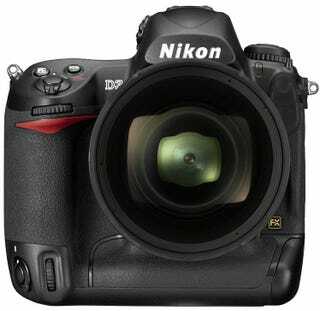 They can then port these settings to any other Nikon camera featuring the Picture Control System, such as the recently introduced D300, so that even when shooting with different cameras, they can get consistent tones for all their pictures. The D3 features Nikon's Multi-CAM 3500FX auto focus sensor module, with 51 AF points, including 15 cross-type sensors that are located in the center of the frame. These cross-type sensors work with all NIKKOR lenses, including those with apertures as small as f/5.6. The D3's auto focus system is closely linked with the camera's innovative Scene Recognition System to deliver greater accuracy in subject detection and focus tracking performance. Nikon's D3 features a revolutionary new Scene Recognition System that greatly enhances the accuracy of, auto exposure, auto white balance detection and auto focus in the camera. The Scene Recognition System uses the camera's built in 1,005-pixel RGB metering sensor to recognize the subject or scene being photographed and detect any movement. This information helps optimize exposure and white balance settings for the recognized subject and also enables the camera to assign appropriate AF points based on any movement of the subject, ensuring highly precise auto focus tracking performance. The D3 features a gorgeous, ultra high-definition 3-inch LCD monitor with 920,000 dot resolution. The monitor provides a 170-degree viewing angle and is very effective in confirming focus on pictures as well as framing a shot using the camera's new LiveView modes. Two new LiveView modes in the D3 enable photographers to compose their shot using the camera's ultra-high resolution LCD monitor. The Tripod mode is designed for precise focus and accuracy when the camera is on a stable platform and the subject is not moving. In this mode, the camera focuses on the subject using focal-plane contrast and any point on the LCD screen can be selected as the focus point for the picture. The second mode, called Handheld mode, allows photographers to use the camera's conventional TTL focusing system, with all 51 points and 15 cross-type points available. When using this mode, the camera activates focusing immediately when the shutter button is pressed, to ensure accurate focus. Nikon's D-Lighting feature in its digital SLR cameras has proved to be a popular way for photographers to quickly compensate for dark areas of a picture after it is taken, without adversely affecting its highlights. The D3 now features an Active D-Lighting mode that when enabled provides remarkable real-time highlight and shadow correction with optimized image contrast. Active D-Lighting produces broader tone reproduction in both shadows and highlights by controlling highlights and exposure compensation while applying localized tone control technology to achieve a more pleasing level of contrast across the entire image. And because the advantages of Active D-Lighting are applied as images are captured, image editing time can be shortened. Several aspects of the D3's usability have been refined to offer professional photographers a satisfying experience when using the camera. The camera's optical viewfinder offers a large, bright image with virtually 100 percent frame coverage and 0.7x magnification in FX-format. The D3 accepts two CF (Compact Flash) cards simultaneously for a myriad of recording options as well as the ability to copy images between the two cards. An integrated HDMI port offers the ability to view images from the camera directly on a high-definition television. The D3 also features the world's first virtual horizon level indicator that uses sensors incorporated within the camera to indicate the inclination of the camera relative to the horizon, on the LCD monitor or inside the viewfinder. The D3 is designed to perform reliably and consistently under the most demanding conditions. The exterior of the D3 is crafted of magnesium alloy and numerous seals are used throughout the body to protect the camera against dust and moisture. The camera's shutter employs blades made of a hybrid of carbon fiber and Kevlar and is tested to 300,000 cycles. The camera also features a Self Diagnostic Shutter Monitor that ensures the accuracy and precision of the shutter at all times. Photographers who need to make small adjustments to correct differences in focusing can do so using the D3's built-in capability to adjust focus specific to a lens. The camera offers the option of either setting compensation for a specific lens so adjustment in focus is only enabled when that particular lens is used, or the camera can apply a uniform level of compensation for any lens used with the camera. Users can store settings for up to 20 different lenses if they prefer to fine-tune the camera's focusing based on specific lenses. The D3 is built around the central theme of ergonomics and the camera's exterior form is designed by world renowned Italian design house, Giugiaro. Every aspect of the D3 is fine-tuned to be ergonomic and help photographers seamlessly work with the camera. Its slightly inclined command dial, comfortable hand-grip, and curves on the pentaprism top, grip and side panels are all part of a new design theme. The D3 is compatible with Nikon's new WT-4A wireless transmitter that provides support for wired LAN (10BASE-T, 100BASE-TX) and wireless LAN (IEEE 802.11a/b/g,). When using the D3 in LiveView mode, the WT-4A can transmit a remote view from the camera and also support continuous shooting through a wireless or wired connection using Nikon's Camera Control Pro 2 software (optional).